Dekar Design creates a summer retreat that’s big on entertaining. The directive wasn’t so much anti-Hamptons as it was globally inspired. “The clients wanted more than just your typical blue and white color scheme,” says Dolores Suarez of the 5,000-square foot, six-bedroom East Hampton home she designed with Caroline Grant for a New York-based couple with two small children. Creating a layered space that didn’t feel “too designed” (another request) in just six months was a tall order, but the co-founders of Dekar Design were up for the challenge as veterans in both commercial and residential projects. The homeowners love to have friends and family over for the weekend, so maximizing the entertaining spaces was a must from the beginning. “Most people with smaller rooms are afraid to put too much furniture, but we actually filled it more,” Grant explains. 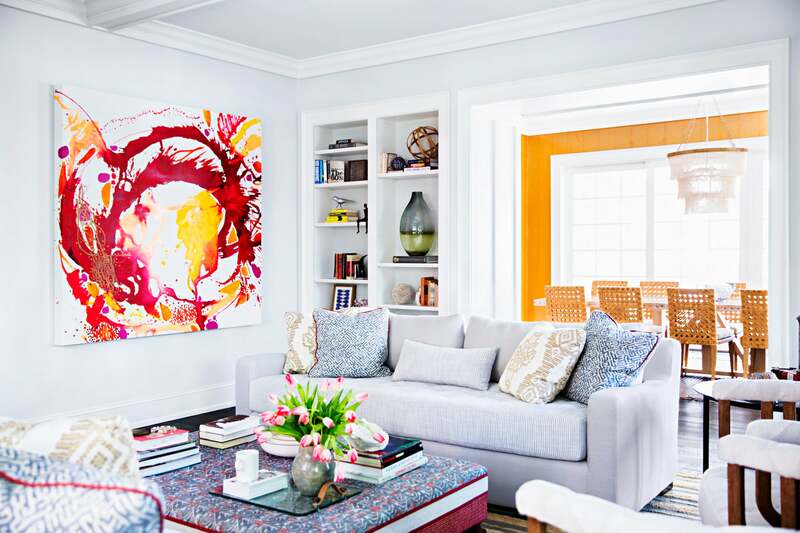 “Surprisingly, it makes things feel bigger.” The custom nine-foot-long couches are placed symmetrically and lend calming, clean lines to the room without it seeming cramped. Another trick was to fix an unusual overabundance of built-ins. “We wanted to open the space a bit,” explains Suarez of how they reconfigured certain areas, creating more floor room in the living room and, in the library, transforming a bookcase (one of the built-ins that made sense) into a bar. photography by Brittany Ambridge The floors are engineered wood. For a similar option, the duo suggests these wide planked, dark stained floors. “We did a really plush upholstered bench, a mix of pillows, and a pair of sconces to help cement what was once just a stair landing as a distinct space” Suarez says. Some pillows were made with vintage fabrics for a one-of-a-kind look, others were sourced at Zak + Fox. The wallpaper is SJW Studio’s Cortina print in “Trigo”. The dining table is custom, the chairs are from Mecox, and the chandelier is by Made Goods. The leather woven rugs, known for durability, are by Lance Wovens. “The clients actually picked out the Jonas Bournat painting, they just wanted us to find a place to put it,” Grant says. “Hung in the living room, it pulls in that rich mustard from the dining room walls, which helps the whole open space feel cohesive.” The mantel was painted in Farrow & Ball’s “Down Pipe.” Fabrics came from Zak + Fox, Michael S. Smith Fabrics, and Hines & Co. The library is an exercise in integrating texture. The faux bois wallpaper is Nobilis’ “Chene Gris” and the coffee table has a faux shagreen top. Instead of going with a typical jute rug, they used another woven leather rug from Lance Wovens. “One of my favorite spaces is the master bathroom,” Grant says. “It went from bland to showstopping with a large Victoria and Albert tub.” The chandelier is by Mr. Brown Home. To add visual interest, the duo used reclaimed barn siding behind the custom vanities. The floor tile is from Mosaic House. The kitchen was left mostly as is, but they built out a bench with upholstered fabric, using a Josef Frank pattern paired with simple stripes. The fabrics were laminated for extra durability. The chairs are Mecox and the stools are from Wayfair. Benjamin Moore’s “Nimbus Gray” lends this guest room its soothing color. The headboard, upholstered with a vintage Uzbeki textile, is L’Aviva Home. The photograph was taken by the client on a trip to Cuba. For the client’s young son, Dekar Design made a custom upholstered bed featuring Osborne and Little fabric. The floor lamp is from Overstock. The photographs were sourced at Clic Gallery. “We often do mismatched bedside tables; it feels more collected and less like a one-shot shopping trip for a bedroom set,” Suarez explains. This design came from Jayson Home. The caned headboard is One Kings Lane. Phillip Jeffries’ grasscloth wallpaper covers the walls in what’s known as the Purple Room. The bubble “Murial” chandelier came from Oly Studios.” “Reclaimed Lewis Nightstands” by cFc flank the custom bed. Suarez and Grant go with a good bargain when they see one, like this four-poster bed from Overstock. They swapped out the plain headboard fabric for a patterned option from Zak + Fox to elevate the look.